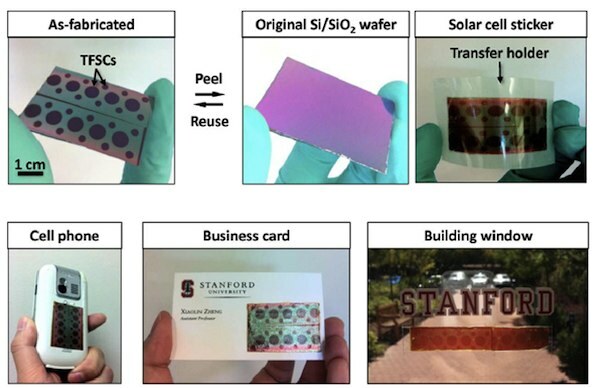 A group of Stanford University researchers has developed a thin-film solar cell that can stick to surfaces like a decal, opening up an entirely new assortment of opportunities to generate solar power. Conventional solar cells are much more limited, requiring a glass or silicon-like rigid substrates in order to adhere, limiting its possibilities. Thin-film solar cells offer much more flexibility, but that does not mean they are completely free of error. Assistant professor Xiaolin Zheng says they have irregular surfaces and a hard time holding up with the thermal and chemical processing, but with the peel-and-stick process, thin-film cells have a new level of attachment and potential that also reduces the cost and weight. The cells are made of a silicon, silicon dioxide, and metal combination that uses a thermal release tape, allowing it to be removed and applied to new surfaces. So far the researchers have placed them on window glass, paper, plastic, and other surfaces, without losing any efficiency. Heat is applied to the cell for 90 seconds, and is then ready to adhere to any surface with double-sided tape or adhesive. The possibilities for a product like this are endless. Cell phones, clothing, rooftops, and maybe even vehicles are just a few of the surfaces that could benefit from peel-and-stick solar panels. There is still work to be done, but it will be interesting to see what kind of uses are found for this new use for solar technology. What would you do with it if you could incorporate peel-and-stick solar energy into your lifestyle?